WASHINGTON, D.C. – Von Miller has been named Week 17 NFLPA Community MVP for donating 2,013 eyeglass frames to kids in need through the Anchor Center for Blind Children in Denver. 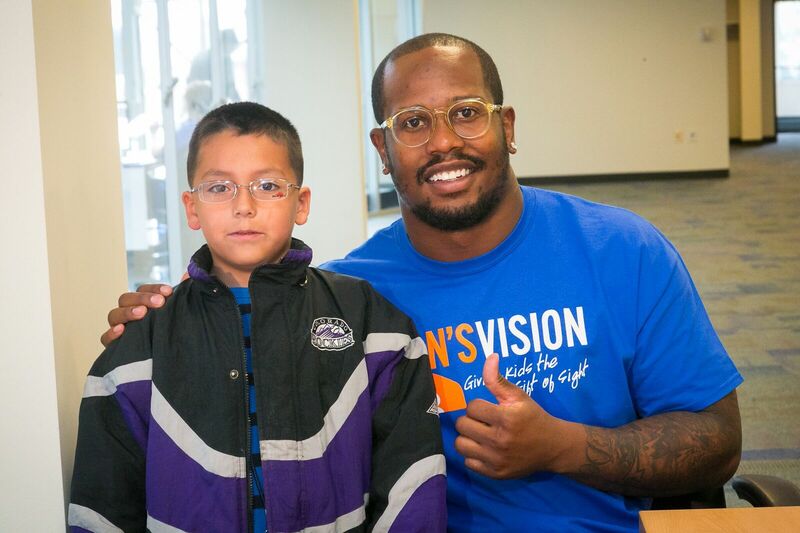 The generous act by the Broncos All-Pro is part of his Von’s Vision foundation, which provides low-income Denver children with the eye care and corrective eyewear they need to be their best in the classroom and in life. By working with the Anchor Center for Blind Children, Miller helped provide early intervention and education for youth ages 0-5 years old who are blind or visually impaired. The seventh-year linebacker, who has struggled with near-sightedness for his entire life, hopes the corrective eyewear will positively impact the children’s lives in the same way that he experienced. Miller’s eyewear donation, which equated to a $503,250 contribution, during the winter holidays capped a busy season for him off the field. Along with raising nearly $400,000 at his annual Celebrity Steak-Out dinner, Miller launched Von’s Vision All Year Long in September, committing more than $1 million-worth of frames to in-need Denver Children over the next two years. In 2017, Miller provided free eye care to 3,278 Denver students, bringing the total to more than 5,000 kids impacted since he founded Von’s Vision five years ago. In honor of Miller being named this week’s Community MVP, the NFLPA will make a $10,000 contribution to his foundation or charity of choice along with an in-kind donation to him on behalf of our supporting partner Delta Private Jets. Miller, along with the other 2017 Community MVPs, will also become eligible for this year’s Byron Whizzer White Award, which is the highest honor that the NFLPA can bestow upon a player. The NFLPA Community MVP program recognizes NFL players who are making a positive impact in their local communities. Each week during the regular season, the NFLPA will celebrate one NFL player* who has demonstrated a commitment to giving back to his community. Please visit our website to read more about the program as well as the current and past winners. *To be eligible for the Community MVP award, a player must be a dues-paying member of the NFLPA and either on a current NFL roster or actively seeking employment as a free agent.